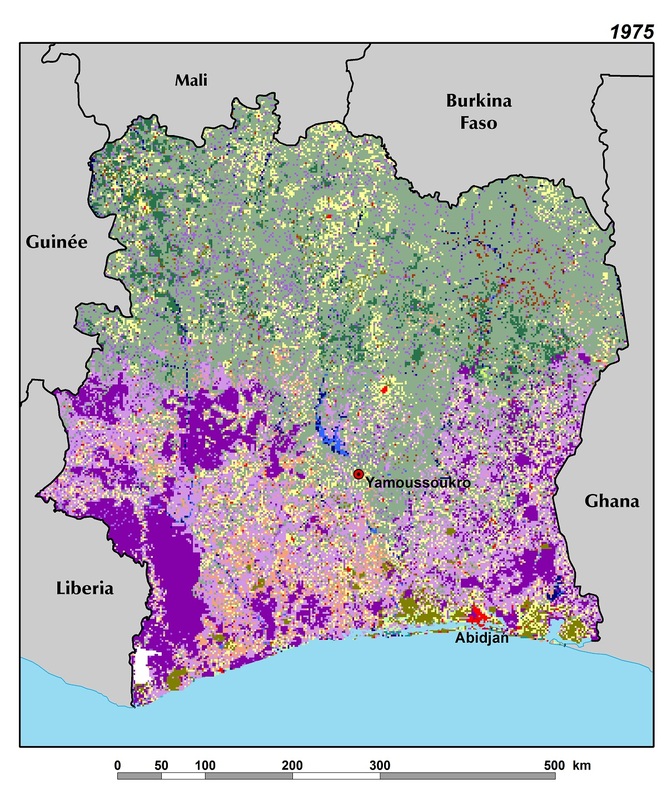 Land use and land cover in Côte d’Ivoire have changed dramatically over the 38-year period between 1975 and 2013. Most striking has been the expansion of agriculture, with a net increase of 84 percent (31,600 sq km). 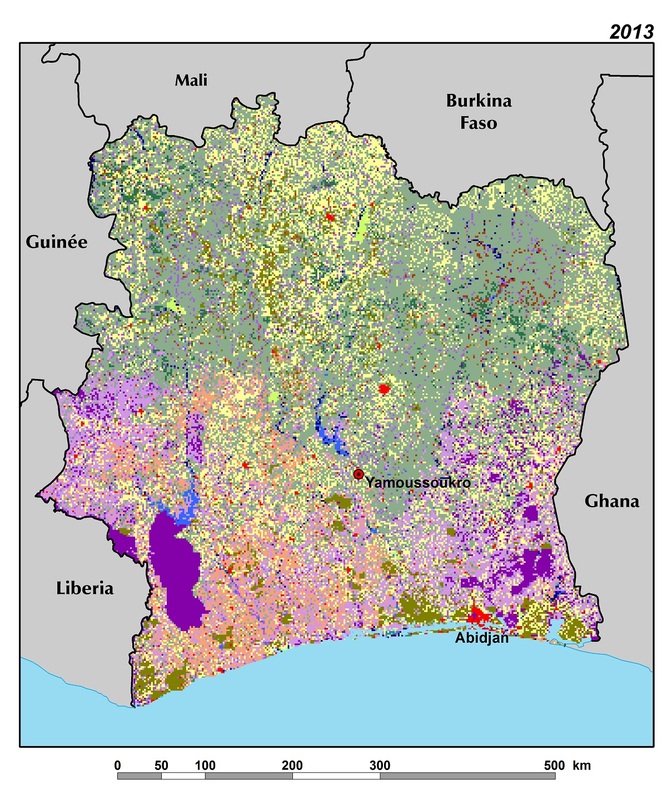 Agriculture spread almost everywhere in Côte d’Ivoire, with the exception of the northeast, where the boundary of Comoé National Park is well respected and the savanna protected. In the southern half of the country, rainfall is higher and the soils more productive, making it the center of production of most of the export crops, such as coffee and cacao. Palm, coconut trees, and rubber tree plantations also increased by 160 percent (10,420 sq km), mostly in the southern and central parts of the country. In the northern half of Côte d’Ivoire, subsistence and cash crops such as cotton, sugar, starches, and rice greatly increased, fragmenting the large expanses of woodland and savannas. Because a large part of the population in Côte d’Ivoire obtains its subsistence from farming, agricultural expansion was mostly driven by population growth. Population increased steadily from 6.6 million in 1975 to 21.6 million in 2013, a rise of 227 percent. On the land cover maps, the area occupied by settlements — towns and cities —doubled from 1975 to 2013. This national average, however, masks an uneven distribution, with much of the population concentrated in the farm- and-forest patchwork region in the south. Expansion of agricultural lands was not without consequences on the forested landscape. Indeed, the continuous deforestation to clear for cultivation is one of the most dramatic and possibly irreversible events in Côte d’Ivoire. In the past, most of the timber harvest occurred within the reserved forests that counted for 40 percent of the total dense forest of the country (14,500 sq km). However, excessive extraction over the past 38 years has led to their depletion, and reserved forests lost almost 70 percent of their dense forest coverage. In addition, timber theft and illegal logging are widespread and are the primary reasons for the degradation of natural forests. Dense forests and gallery forests, as well as woodland outside protected areas, are all heavily degraded. By 2013, Côte d’Ivoire had lost nearly 60 percent of the 37,300 sq km of dense tropical forests that existed in 1975. Similarly, degraded forest decreased by 28 percent and woodland area declined by 48 percent. Another important forest class is the gallery forest — dense ribbons of biologically rich forest that follow watercourses and river systems up into the Sudanian zone savannas in the north. While they are limited to narrow strips of dense forest, their total area covers almost 5 percent of the country. In 1975, the gallery forests represented 17,100 sq km. This figure decreased to 14,130 sq km in 2013. Despite recent forest management efforts taken by the government, such as halting illicit harvesting, promoting reforestation, reformation of logging activities, increasing the protected areas, and encouraging private investments in forestry, expansion of agricultural lands driven by an increasing population remains the key driver to deforestation in Côte d’Ivoire (Ehuitché, 2015).